I bet you guys didn’t know Joe Manganiello was also Flash Thompson. And, no, I don’t mean in Spider-Man: Homecoming. I’ll prove it in a bit with a fun GIF actually. He was Flash Thompson again Tobey Maguire’s Spider-Man in Spider-Man 3! From there he proceeded to rock the screen in shows like One Tree Hill, How I Met Your Mother, True Blood, and even starring in Magic Mike! But, what’s the most exciting news in a while is that he’s now becoming our Deathstroke!!!! Uncredited in Justice League and announced to be in two movies: The Batman, and Deathstroke. Alright. So when I originally searched Manganiello’s height and weight for you guys the Google search showed a Jason Statham comparison and I didn’t immediately realize it a comparison and was absolutely shocked that Joe was 5’11. He actually joins the crew of the tallest men we’ve ever had at SHJ. The Mountain being first at 6’10, followed by Batista at 6’8 and then Joe Manganiello at 6’5, with Ben Affleck, Dwayne Johnson, Jason Momoa, and Ray Fisher coming in just below that at 6’4. Right below that is the average height we see, right around the 6’1-6’3 mark with our triple Chris threat, AKA: Chris Pratt, Chris Hemsworth, and Chris Evans. Plus others like Stephen Amell, Adam Driver, Tyler Hoechlin and a ton of others. But, as to attempt not to forget the shortest, we’ll name the guys like Tom Holland, Zac Efron, Mark Wahlberg, and Daniel Radcliffe. Either way, though – don’t worry! These routines are all made for anyone and everyone and this is just a fun comparison. Evolution: The Cutting-Edge Guide to Breaking Down Mental Walls and Building the Body You’ve Always Wanted . 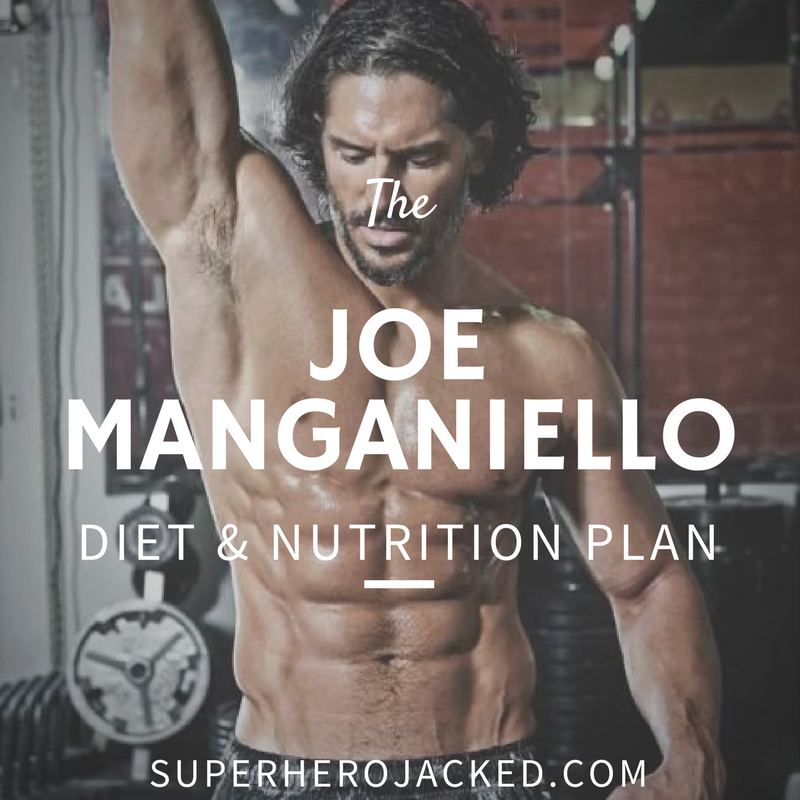 For that reason, I’m also going to be including material from the book within this article, as well as any new information that I can find from Manganiello and his workout routine and dietary structure. 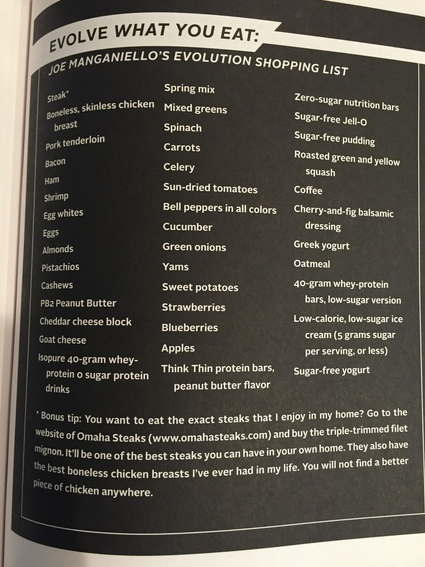 Let’s start with some great information from the book that seems to be relevant throughout Manganiello’s diet to this day (the book was published on Amazon in 2013). You’re basically staying away from processed foods, and sugar and sticking to a dietary restriction that has a lot of similarities with what we use in The Academy with the Nutrition Classes (SuperHuman, Samurai, Viking, Hunter Gatherer, Monk, Minimalist, Spartan). Obviously, if you’re an SHJ Army or Academy member, you know we shoot for sustainability above all things – and adding in some awesome pillars like intermittent fasting and cyclical ketosis only step up our diet even further. So, those are definitely things I recommend checking out if you’re going to be giving this diet a shot. Another thing I’d like to add is that Joe Manganiello does not have any alcohol on the list. He says alcohol is “the destroyer”, so not only is it not there, but he’s pretty clear on his feelings towards it. Something else that’s really cool before we move on is the fact that Men’s Fitness has a full breakdown of Manganiello’s diet (full 7 day breakdown of each food). SO, instead of posting it all here, I made it into a PDF for you guys! Joe Manganiello’s workout routine isn’t a typical “bodybuilding” as you may expect from his physique. Sure, he hits the weights, and he enjoys incorporating the typical, but he also shares various formats of training on his Instagram and via social platforms – ranging from CrossFit style training, even with maces, weighted vests, weighted slam balls, and more – all the way to kayaking and outdoor intense sports and activities. He’s definitely one of your typical badasses like the Jason Momoa type. But anyways, onto some sources. I want to also give you some information from his book, and in an article in Elle Magazine we get some awesome content from a women who tried his program of 6 weeks. For my first session, I dragged my husband along. “Maybe I’ll do this with you,” he said cheerily. The workouts are in the book, I’m not going to outline them in great detail, but that first day will be burned on my brain forever. It was a chest and back day (werewolves do chest and back on Mondays and Thursdays, legs and triceps on Tuesdays and Fridays, shoulders and biceps on Wednesdays and Saturdays), and it began, like every day for the next six weeks of my life, with Joe’s Dynamic Warm-Up: 20 lunges per leg, 15 squats, 15 push-ups, 30 seconds of side-to-side jumping, and 30 seconds of front-to-back jumping. The first circuit was a combination of barbell bench pressing and lat pulldowns. That’s fine. What wasn’t fine was the rep count. You have never seen these reps before. No one thinks this makes sense. This means you press 20 times and pull down 20 times, then press 15 times and pull down 15 times, and so on. It means that, as you get tired, you do fewer reps, which makes sense, but then, for no reason, you start going back up. This is not normal. This is not what people do. Much of the next six weeks will involve you saying “I don’t….what?” and then doing something and it making you stronger but you not understanding why or how. Then there were more exercises. There were always more exercises. Like pregnancy, the middle part is the best part. You’re getting stronger, you spend less time swapping out your weights for different ones, and you’re seeing enough results that you’re willing to play along with Joe “Mad Genius” Manganiello’s bizarre philosophy of lifting. Cardio is added, and you accept that. People do cardio. You get used to precisely timing 60 seconds or 50 seconds of rest between movements, as per his instructions. During this phase I remember watching “The Battle of the Bastards” episode of Game of Thrones and saying “…pussies” dismissively as men were gored to death by bayonets. I do not think this was a defensible thing to say, I just want you to understand what sort of person you become on your way to achieving werewolf-ness. This is when the wheels really start to come off in your brain. Fasted cardio was added to the plan. Daily, fasted, cardio. I no longer spoke at the gym, a place where once I shared confidences and humorous ripostes with my friends and trainer and loved ones. Now I just muttered things darkly and rolled my eyes. Everything was a drop set. So many drop sets. Things hurt less as I did them, but parts of me would just stop working. I wouldn’t say “I don’t think I can do any more push-ups.” I would just lower myself and then fail to get back up again. I looked beautiful, but took little pleasure in it. These two weeks had to be endured. I was thinking of cutting out some of the article’s explanation, but if you look past some of the exaggeration there actually is some pretty good humor in it. Also, aside from this information, I found some more info on Muscle and Fitness (specific movements), and a separate Men’s Fitness article that gave me some others as well. I’ll be combining these articles, Instagram information, and his book to give you the most badass Joe Manganiello workout ever. 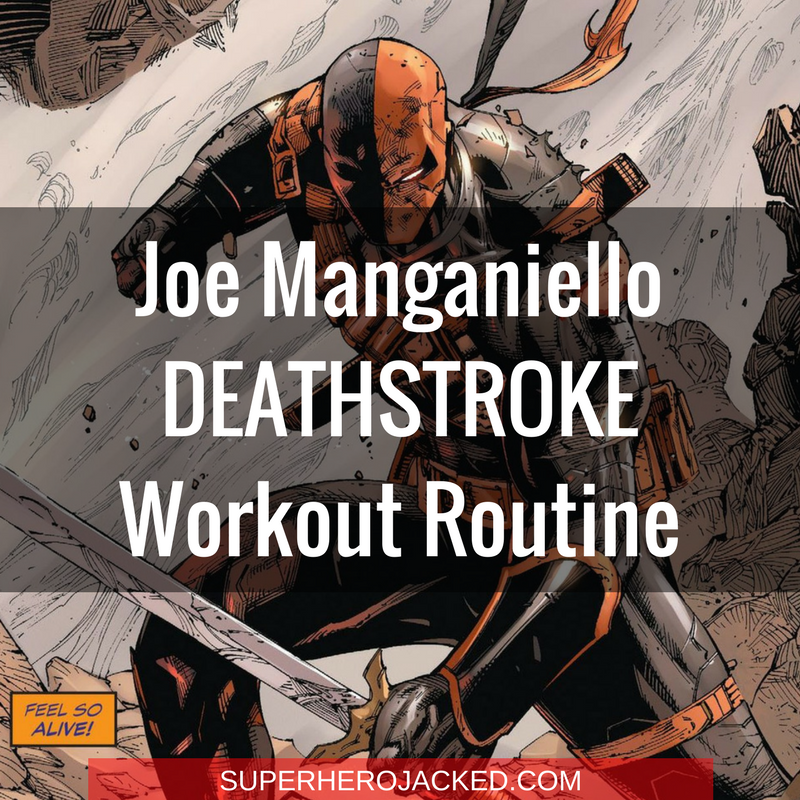 I’m going to be giving you a combo on Joe Manganiello’s book routine, combined with some circuit CrossFit workouts and more! “The first circuit was a combination of barbell bench pressing and lat pulldowns. We’ve actually seen this one on the site before performed by Chris Pratt and John Krasinski (shown in the Krasinski article).